While pundits and fusspots continue to question whether we’re headed for another housing bubble, consider this: The most recent mortgages were among the highest quality (lowest risk) since 2001. 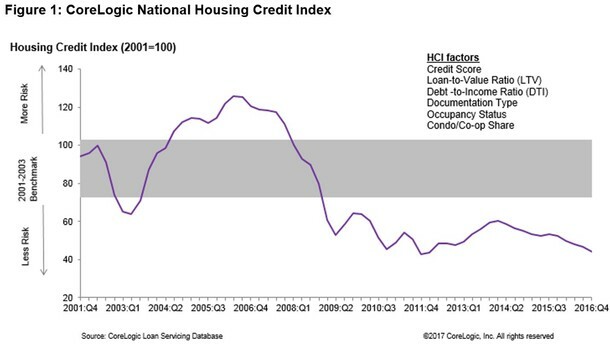 Indeed, mortgages originated during the fourth quarter of 2016 were of the utmost quality, exhibiting even less risk than those funded a year earlier, this according to the latest CoreLogic Housing Credit Index (HCI). While the mortgages look pretty darn good, the company did note that the reduction in risk from both a year and a quarter earlier could be partially attributed to a higher refinance share. Per CoreLogic chief economist Frank Nothaft, refinance borrowers tend to have lower loan-to-value ratios (LTVs) and debt-to-income ratios (DTIs) than their home purchase counterparts. And because mortgage rates have since moved higher from late last year, default risk could increase as lenders loosen underwriting guidelines to accommodate “harder-to-qualify borrowers.” Nothaft added that fraud could also rise as the mortgage market becomes more purchase-heavy. As you can see from the chart above, mortgage credit risk has gone down sharply over the past several years. It was highest in 2006 when home prices peaked and options arms were all the rage (they aren’t slated to resurface anytime soon or ever). During the fourth quarter, the average credit score for home buyers was 737, up 4 points from the fourth quarter of 2015. Additionally, the share of buyers with credit scores under 640 (not quite subprime but on the riskier side) was roughly one-tenth the rate seen in 2001. In other words, mortgages continue to go to really creditworthy borrowers, which is generally a good thing, though not completely immune from risk. Meanwhile, the average DTI ratio for home buyers in Q4 2016 was 36%, unchanged from a year earlier. At the same time, the share of buyers with DTIs greater than or equal to 43% (the Qualified Mortgage cutoff) was up “slightly” compared to levels seen in 2001. Finally, LTVs were up by less than one percent year-over-year in the fourth quarter, rising from 86.7% to 87.1%. The only potentially troubling data point was that buyers with an LTV of 95% or higher increased by more than one-fourth compared with 2001. Is Down Payment Still the Biggest Problem? That tells me down payment continues to be the biggest hurdle to homeownership, and perhaps the biggest risk facing the housing market as home prices ascend to new heights. While many borrowers have excellent credit scores and no problem making monthly housing payments, a large proportion are unable to put down a sizable down payment. Aside from making it more difficult to qualify for a mortgage thanks to private mortgage insurance and a higher mortgage rate, it also means these borrowers are at greater risk of falling underwater if things take a turn for the worse (again). And if there’s an expectation this time around that home buyers will be bailed out in such a situation, we could have another big problem on our hands during the next crisis. 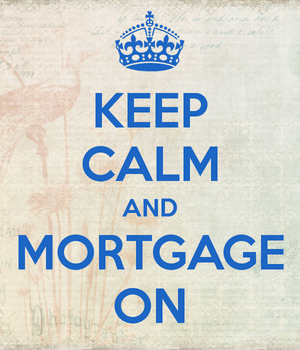 But because the mortgages being underwritten today are of the utmost quality, we may actually avoid a similar fate. You have to remember that aside from being upside down on the mortgage, many of those same borrowers couldn’t actually afford to make their payments. Today’s borrowers can. And that’s a very important detail.